Worst ever job was telesales for a dodgy company selling something to do with rates......they later ended up on watchdog. I can't remember the name but it was a binatone games set which had very basic games built in. all the games were pretty much the same!! 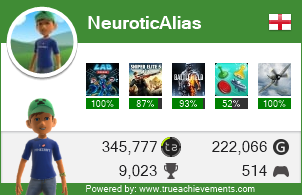 Tricky - ME3 and Skyrim rank highly for me. When I've been allowed to run matches on COD4 and created the most random matches. Lots of fun had. Bear Grylls! You'll either learn to survive living well or get off of it! There's a character in X-men called Prodigy who could absorb and use all knowledge and skills from those around him. That would be the one for me. It is what it is and will be what it will be, so relax step back and chill. There's no point in getting stressed over stuff so just enjoy it all. What? I mean that they make great harddrives over there, of course. I went about 3 years ago. Was really good out there and so cheap for everything! If you ever go make sure you get your shots so you can try the street food! Well worth a go! I didn't even know UltraMarathons were a "thing" until today. They're a big and growing thing! Good fun as well although it seems that there are a lot more in places like America. The ones in England are growing though and some good event runners emerging too. You still can Failed! Just have to sort it for you. For it was I that gave him that nick name! Mwahahahahahah !